In simple words, the Qemu is a software program which is free and open source; used to create virtual machines over the top of other Linux operating systems just like VirtualBox and VMware workstation player. Not only, the Linux but one can also install this software on Windows and MacOS to test different Linux distros. 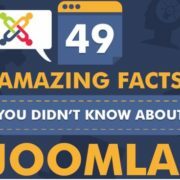 However, most of the Linux users prefer to use the VirtualBox because of its easy-to-use interface and a wide range of hardware compatibility. Although the VMware Workstation Player is available too for Linux, limited in terms of features as compared to VirtualBox. 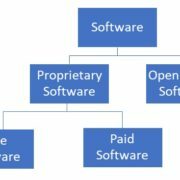 In such circumstances, there are a couple of well known opensource hardware virtualization software available with their own Linux operating system environment those can convert any bare metal machine into a full virtualization platform. We talk about such platforms in some other article. 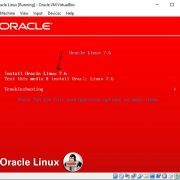 Here in this Qemu Ubuntu tutorial article, we will see how to install and setup this open source machine emulator and virtualizer tool on Ubuntu. We can run OSes and programs by executing the guest code directly on the host CPU using this software. It supports virtualization using the KVM kernel module in Linux. When using KVM, one can virtualize x86, server and embedded PowerPC, 64-bit POWER, S390, 32-bit and 64-bit ARM, and MIPS guests. To install Qemu on Ubuntu run the following commands given below. Note: We used Ubuntu 18.04 to install and create a Kernel based virtual machine but the commands given here are the same for the older versions such as Ubuntu 17.04, Ubuntu 16.04, Ubuntu 15.04… While the writing this tutorial the latest version of Qemu was 3.1.0. Open the Command line terminal tool on Ubuntu. The shortcut is CTRL+ ALT+T. 0 upgraded, 38 newly installed, 0 to remove and 366 not upgraded. Need to get 54.9 MB/62.2 MB of archives. 0 upgraded, 1 newly installed, 0 to remove and 366 not upgraded. Need to get 13.2 kB of archives. Selecting previously unselected package qemu-kvm. 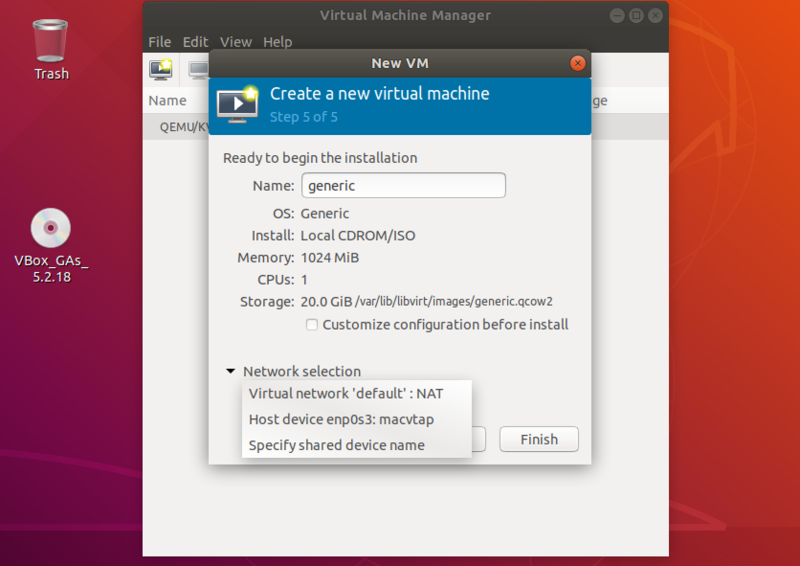 After installing the Qemu on Ubuntu host system, its time to create virtual machines. Note: In the above command the Puppy.vdi is the name of our virtual hard drive. You can name it as per your choice. The extension.VDI will create a Virtual DISK image format if you want you can replace it with .img (raw image format) .vhd, and .vmdk formats you do that too. We can also use the Qemu default virtual hard disk formats which are .qcow2, .qed, .qcow and .cow. 10 G is the amount of space we want to allocate to the Virtual hard drive. Here we are installing Puppy Linux which doesn’t require a high amount of space at all, so we used 10 G (G stands for Giga Byte GB). However, in this tutorial, we are using the VDI disk format. After creating the Virtual hard disk, let’s boot the ISO in Live environement. We are using OS type Linux i.e the Puppy Linux ISO image resided on the desktop of our Ubuntu. In the above command, we used the ISO image that is on our desktop folder. In the same way, you have to mention the path of your ISO file in the command; rest of the command will remain the same. The -m indicated the amount of RAM assigned to guest OS from the host system, here it is 512 MB. In the above command line, the Qemu will fetch the booting files from the CD-ROM disk drive. To accelerate QEMU virtual machines, we can enable the KVM or Intel HAXM. So, to run VM faster use the instructions -accel kvm or -enable-kvm for KVM and -accel hax or -enable-hax for Intel HAXM. After the installation of the guest operating system, now if we want to boot our Virtual hard disk for further use or already have some VDI or VHD hard disk image then simply use it with the below command. Note: We have to give the complete path where the image resides and also where we want to save the converted one. After going through the above command and the procedure for installing a virtual machine on QEMU; you might want to give up because of its complexity. But wait there is a simple and easy to use create VM method on this Virtualization Tool. It is by giving it a graphical user interface just like the Virtual Box. Hence, if you are a new user and want to save your self from writing the lengthy commands then run the below command to install the Virt Manager on Ubuntu. qemu is already the newest version (1:2.11+dfsg-1ubuntu7.9). 3 upgraded, 65 newly installed, 0 to remove and 363 not upgraded. Need to get 11.0 MB/15.8 MB of archives. After this operation, 57.5 MB of additional disk space will be used. 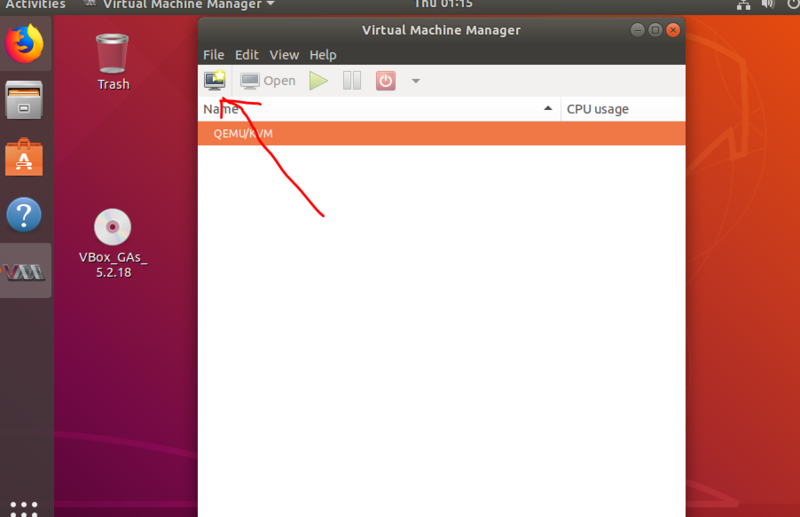 After running the above command you will see a Virtual Machine Manager tool called Virt on your Ubuntu system. To access the Virt Manager virtual machines, go to all applications and click on the Virt icon. When the Virt Manager opened, Click on the first option from the left side given in the top menu. 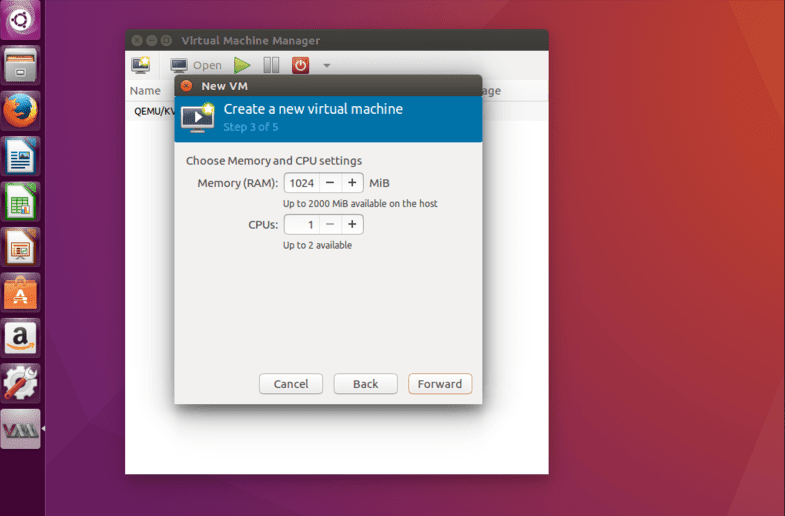 This option will give you a guided GUI for creating and setting up Virtual Machines. The process is the same as the VirtualBox. Then select the booting of medium to ISO image and then assign the RAM, number of CPUs, and virtual hard disk. While creating the VMs on the Virt Virtual Manager for Qemu you will get a network selection option too from where we can select the Virtual Networks for our machines. By default, the Virtual network ‘default’ NAT is selected, leave it is as it is if you don’t have multiple connections. It is in the NAT that uses the host IP address range to share the internet connection. 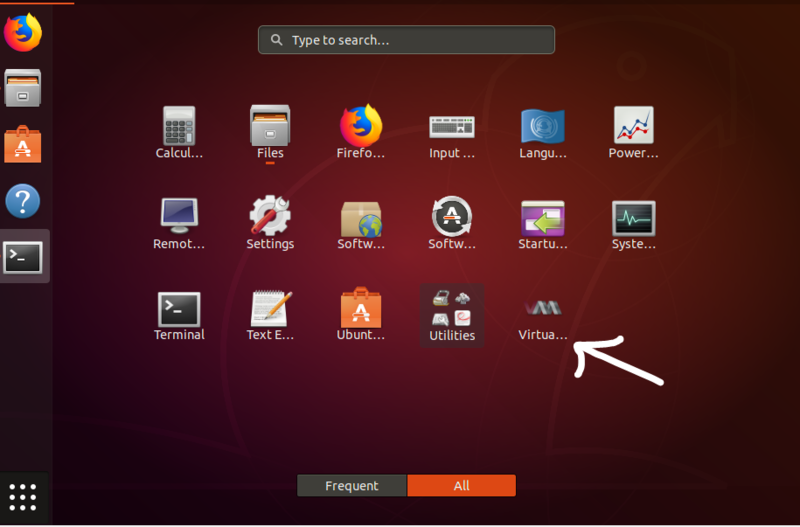 So, in this way, we can use this Virtualbox alternative software not only on Ubuntu but also for other different Linux OSes for creating Virtual Machines. This Virtualization software has its own benefits over the VirtualBox such as faster speed as it directly uses the kernel module. Moreover, if you make your self acquainted with its commands then setting up VMs on the headless servers become a piece of cake. However, it supports almost every kind of operating system emulation but as compared to Linux for Windows guest OS it is a little bit slow. In such situations please enable the KVM or Intel HAXM accelerator modules. Also, the point to be noted, in the latest version KVM support has been dropped but the open source HAXM will still continue. If you faced any problem with following this tutorial, please let us know the comment section is all yours!